from. It’s only been recently since I have found these fruit cups. 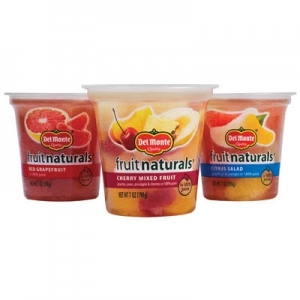 Unlike the ones with the jello and fruit mixed in, these contain all natural fruit juice instead. In my opinion I like these much better. Besides tasting good they are pretty healthy especially since they say that they are made with no sugar added or containing artificially sweetened water. My favorite flavors are the sweet and citric Red grapefruit,as well as the mandarin orange. I also like the hawaiian one with the pineapple, and I also enjoy the taste of the fruit medley with the pears,cherries,apples, and a variety of other fruits. Im so addicted to these fruit cups and the assortment of flavors. grocery store I find deals where I can buy about ten of them for five dollars. They fit pretty well on my budget because of this so that I can buy them most of the time. My only con would be that they are really messy. They fill the cup all the way to the top of fruit juice. have made a big mess a bunch of times so if you don’t want to make a mess you have to open them over the sink. The juice is natural just like the fruit is so it doesn’t taste like some of the other brands with added corn syrup. Nonetheless, if you’re dieting or a fan of fruit cups I would recommend these.